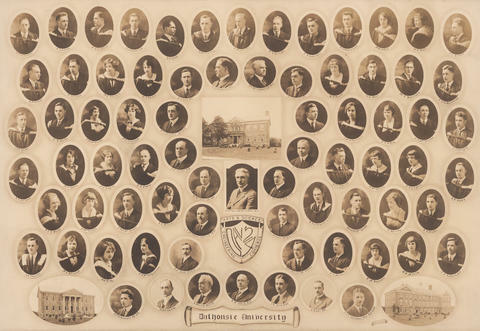 File is a composite photograph of the Faculty of Arts and Science, Class of 1924. The photograph consists of 75 individual portraits. Individuals identified as follows: O.M. Clonston; K.H. Aorton; C.C. Coffin; W.A. Richardson; R.C. Robb; D, McCarthy; R.M. Williams; C.H. Pringle; T.A. Robertson; T.W. Sutherland; M.R. Butler; C.E. Read; S.L. Profitt; D. McCnish; H. Hamilton; M.G. Smetnam; D.J. Jamer; H.S. King, BA. ; C.B. Nickerson, MA. ; D.S. MacIntosh, BA., MSc. ; C.L. Bennet, BA. ; G.M. Black; W.H. Sman; W.C. Harrison; C.D.W. Beckwith; W.A. Hemat; C.H. Parks; C.M. MacCalder; M.G. Colqnhonn; E.W. Nichols, MA., PhD. ; W.R. Marmell, MA. ; R.M. Onttensham; M.G. McKay; A.D. MacKinnon; J.W. Longley; R.S. MacLeod; M.E. Gohen; E.F. Rogers; H.A. Frame; G.E. Wilson, MA. ; M. MacNeil, BA. MA. ; A.S. MacKenzie, PhD., LLD., FRSC., Pres. ; H.L. Stemart, PhD., FRSC. ; H.F. Munro, BA., MA. ; F.W. Bissett; M. MacKenzie; H. Campbell; R.F. Ross; F.C.A. Pomer; F. MacKinnon; J.D.N. MacDonald; A.E. McKean (Life vice pres. ); A. MacMechan, PhD., LLD., FRSc. ; H.L. Bronson, BA., PhD., FRSC. ; D.S. Campbell (Life Pres); Donald McInnes; C. Murray; A.T. Mader; J.L. Thurber; M.J. O'Connor; M.G. King; E.E. McKay(life secr); H.N. Jones, BA., PhD. ; M.C.H. Mercer, MA., B.Comm. ; A.B. Morton(life treas); B.M. Seaman; G.E. Mills; C.K. Sutherland; J.M. Gomanlock, BA., BSc. ; W.P. Copp, BSc. ; H. Murray, BA., LLD. ; D. McIntosh, DSC. ; L.C. Hunt, BBA. ; H.P. Bell, BSc. ; J.H.L. Johnstone, MSc., PhD., MBF. Description created by Sophie Boucher on January 23, 2018.